Quesadillas are a quick and easy, family-friendly dinner idea perfect for weeknights and eating on a budget. If you happen to have leftover pulled pork on hand — then you’re really talking budget-friendly! 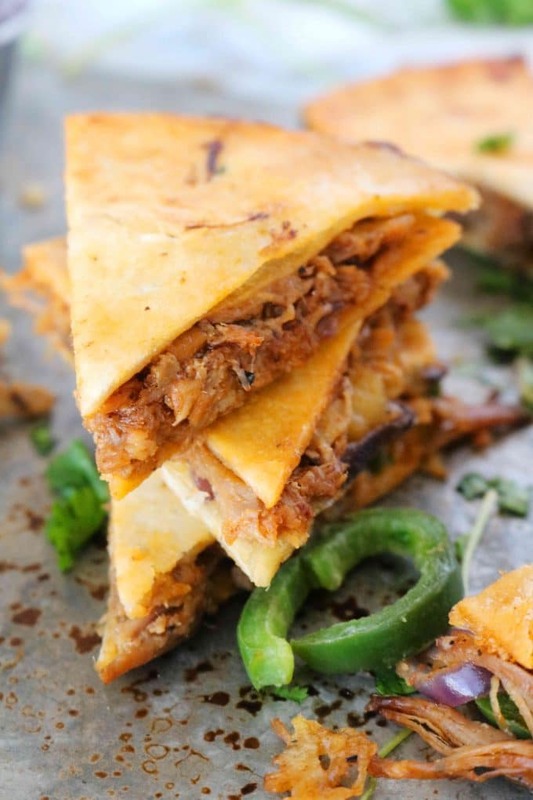 Because now you can put those leftovers to work for you in Pulled Pork Quesadillas. They’re not only loaded with flavor but are over-the-top easy to make! In addition to a loveable family recipe that requires all of 20 minutes and only a few ingredients, we’ll cover all the basics like why you should always cook quesadillas over medium-low heat, one simple tactic to avoid a messy flip (keeping the contents inside of your quesadilla), plus, how to keep them from getting soggy, freezing tips, and more! A quesadilla is like the perfect little Mexican sandwich, and they come in all different variations, from cheese to chicken to steak to veggie. If you can stuff it in between a layer of flour tortillas along with some melty cheese and cook it on the stovetop, it’s pretty much a quesadilla. The filling possibilities are practically endless and you might find it easy to allow your imagination to run wild. Just be sure to make a pitstop at the pulled pork quesadilla, because this one should not be overlooked. Pulled Pork Quesadillas start like any traditional quesadilla — with flour tortillas. Not corn tortillas. You’ll want to use a standard, 8″ tortilla. And, of course, you can’t have a Pulled Pork Quesadilla without the pulled pork. These quesadillas are perfect for using up leftover pulled pork. For this recipe, I prefer to use this Slow Cooker BBQ Pulled Pork. This particular pulled pork recipe begins with a quick and easy concentrated BBQ sauce/rub that infiltrates ever bit of the pork and is extremely flavorful. The best and most common cheese used for making quesadillas is shredded Monterey Jack as it is subtle in flavor and melts easily. However, you aren’t necessarily limited to using this cheese alone. Pepper Jack, White Cheddar, Chihuahua, and Oaxaca cheese would all be acceptable for use in your Pulled Pork Quesadillas. The onion and jalapeño in this recipe are optional, so if you’re short on time or feeding a crowd of picky eaters, feel free to omit them. However, they will add a great deal of flavor to your quesadillas and they also happen to pair perfectly with pulled pork. If you’ve got the time, it’s most definitely worth the extra couple of minutes to slam out these veggies in skillet. Drizzle oil in a pan over medium-low heat, add a tortilla, and sprinkle with cheese. Sprinkle only half of the tortilla with pulled pork and veggies (if using). Wait for the cheese to get melty. Fold the cheesy side over the pulled pork side using a spatula, and hold down until ingredients meld together. Quesadillas and grilled cheeses have a lit-tle more in common than one might think — it’s all about the melty cheese. The cheese is the glue that holds everything together when it comes to Pulled Pork Quesadillas…or really any quesadilla for that matter. It’s very important that you use medium-low heat so the cheese can melt before the tortilla blackens. WHY USE THE FOLD-OVER METHOD? Use the fold-over method rather than the flip. Folding a tortilla in half versus flipping one on the stovetop is not only easier, you’re much more likely to keep your filling in tact this way. Bonus. To do this, you’ll add pork to only one half of the tortilla, and the same goes for the veggies if using them. Just to be clear though, the cheese goes all over the tortilla. Because remember, the cheese is the glue. Then, once the cheese is melted all across the tortilla, use your spatula to fold the cheesy side over the pulled pork side. Use the back of your spatula to hold the quesadilla in place, just until everything inside is melded together. It’s very likely you’ll only be able to fit one tortilla at a time on your pan, therefore batching out what remains. As hot things sit against a flat surface (like a plate) they tend to build up condensation and get a soggy bottom-side. Boo that. If you want your Pulled Pork Quesadillas to stay nice and crispy, place them on a wire rack instead. Pulled pork is good in the refrigerator for 3-4 days from the day that you made it. If you’d like to extend the shelf life or your eyes were bigger than your stomach and you made one too many Pulled Pork Quesadillas, no worries — you can freeze them! You can keep quesadillas in the freezer for up to 2 months. 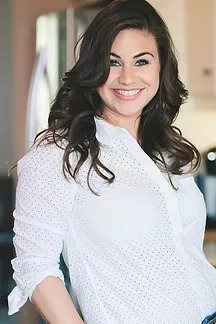 To freeze them, transfer the cooled quesadillas to an airtight, freezer-safe container, separated by sheets of wax paper to prevent them from sticking and developing freezer burn. It’s best if there is not too much headspace from the quesadillas to the lid. You can also wrap your cooled quesadillas in wax paper and place them in a freezer-safe, zip-top gallon-sized bag. 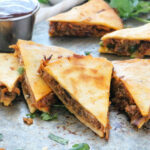 WHAT TO SERVE WITH PULLED PORK QUESADILLAS? Serve Pulled Pork Quesadillas with Restaurant-Style Mexican Rice, Tex-Mex Black Beans, or Mexican Charro Beans, and don’t forget the BBQ Sauce for dipping! Slow Cooker BBQ Pulled Pork features perfectly tender shredded pork coated with an easy, flavorful BBQ sauce. Leftover Pulled Pork Salad turns pulled pork into an easy salad featuring shredded lettuce, cabbage, french fried onions, a tangy barbecue dressing and more! Pulled Pork Sliders are great for using up pulled pork leftovers and are seriously easy to assemble. A great kid-friendly dinner idea and an inexpensive way to feed a crowd! Oven-Baked Country-Style Pork Ribs are braised in a quick, savory, homemade barbecue sauce. An ideal recipe for slow-cooking Sundays and family dinners. Slow Cooker Spare Ribs yield the perfect bite with a burst of big BBQ flavor, but best of all — they’re easy to make! 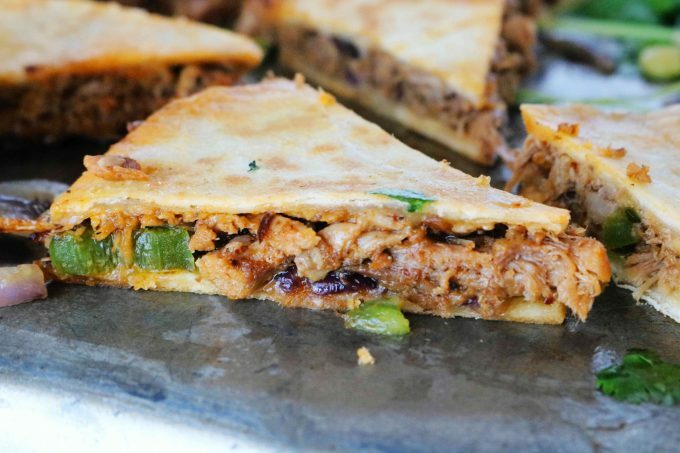 Pulled Pork Quesadillas are quick and easy dinnertime option the entire family will love, and the perfect way to use up that leftover pulled pork! If using the onion and jalapeños, add 2 tablespoons of canola oil to a large pan over medium-high heat. Add the onion and jalapeño and sauté 4-6 minutes, or until softened. Transfer the vegetables to a bowl and set aside. Carefully, place 1 flour tortilla on the pan and scatter about a 1/4 cup of shredded cheese over the entire tortilla. Then, to only one half of the tortilla, add about a 1/3 cup pulled pork, followed by a light sprinkle of the vegetables, if using. Once the cheese starts to melt (about 1 minute), use a spatula to fold the side with cheese only over the pulled pork filling. Hold the quesadilla down with your spatula until the filling has melded together, about 30 seconds to 1 minute more. How great are these?!! This would be wonderful with leftover pulled pork. I like that you dip in BBQ sauce instead of salsa. How fun. Thank you, Mimi! Yes! This one is great for kids 🙂 …and the grown-ups! Ha! I love all the details you give in this post! So many helpful tips and tricks in here. I will have to try the foldover next time I make these! 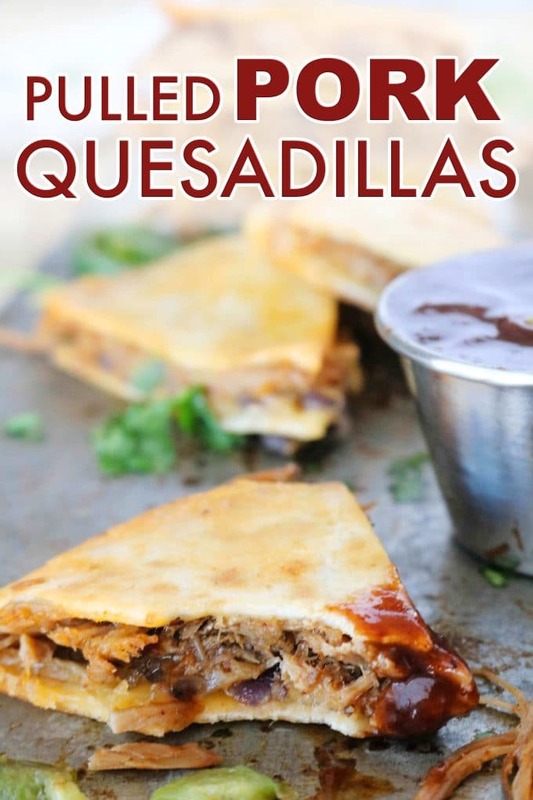 I absolutely love Quesadillas and this pulled pork version looks great! Yum! Ouh yeah!!! You really stuff these, I like that! 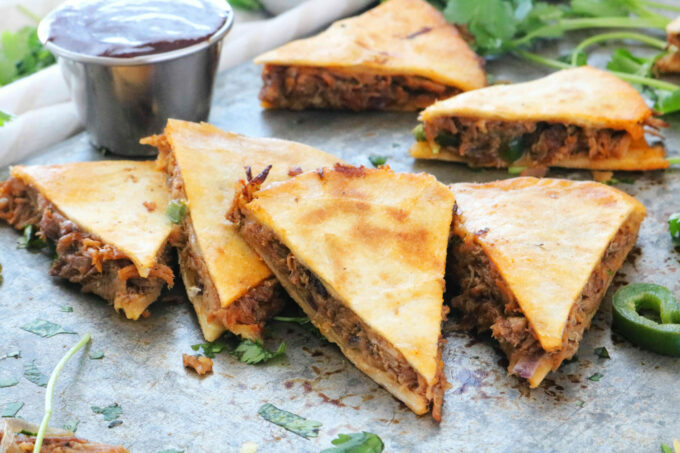 These pulled pork quesadillas look so good! I would love them for dinner or a movie night snack. They look great. The quesadillas are the perfect finger food. And such a great tip on how to freeze any leftovers. Thanks for sharing. I could totally go for a plate of those quesadillas tonight. Yum! When I can make a meal that is transformed from another to make an amazing dish using leftovers, hello fabulous! 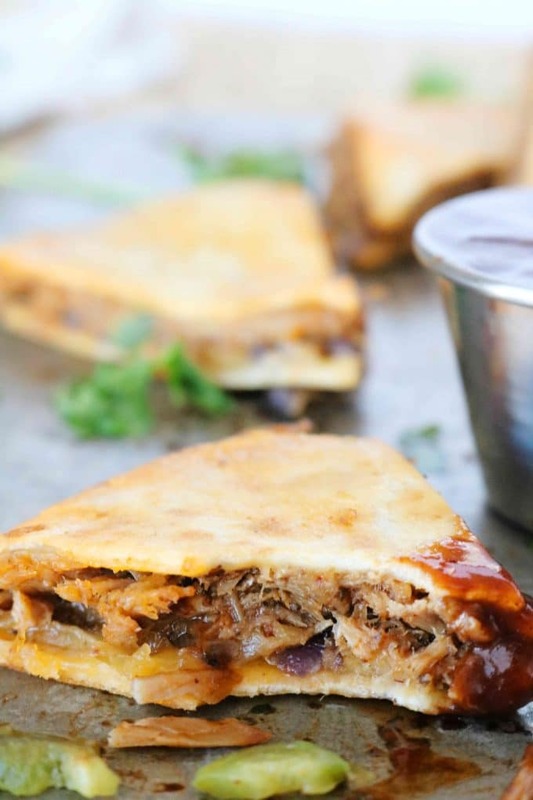 These pulled pork quesadillas are fantastic and being able to freeze some for later is great! Great tips to keep the quesadillas crispy by using the wire rack too! I love pull pork and quesadilla. Put them together this is a perfect meal.